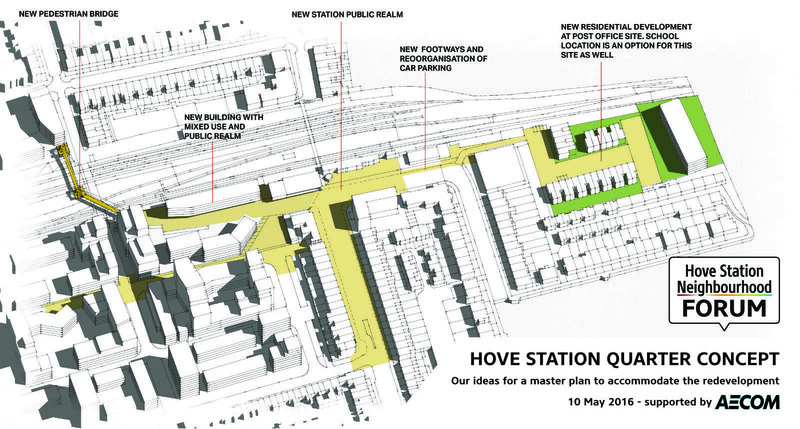 What do you think about the Hove Station Quarter Concept Plan? There are three major developments happening or about to happen in the Hove Station area. This is the result of top-down planning by the city council. 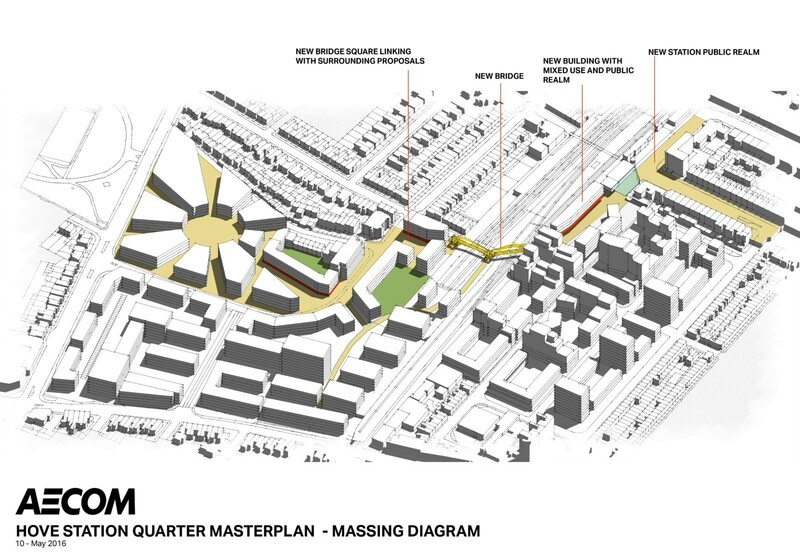 In response to this, the Hove Station Neighbourhood Forum have produced ‘The Hove Station Quarter Concept Plan and Options Study’ (ideas for a Master Plan). This features a wide range of community-led proposals – including public squares, bridge, footways and a possible school site – in order to support and accommodate this development. This work was led by residents including town planning experts and architects. It was funded by DCLG and prepared by urban design specialists AECOM. This is an evolving plan and we are seeking feedback from the local community. Please see the questions below. Goldstone Retail Park – longer term redevelopment? The landowners have indicated that they have no intention of making the site available for redevelopment within the period of the Neighbourhood Plan – i.e. before 2030. However, ownership of land can change and the current owners may change their minds when they become aware of the positive future impact of the Mountpark project to the west. Hence, a member of the Forum Committee – David Kemp – has produced a concept scheme to show how redevelopment for mixed use residential and employment could work on the site. Amongst other things this would celebrate the history of the site as the former home of Brighton and Hove Albion FC – the centre of the development would mark the kick-off spot. The original design has now been incorporated in the Hove Station Quarter Concept Plan – but modified to accommodate the Hyde project. The development of Hove Newtown area of the Hove Station Quarter starts next month with the demolition of the derelict factory at the corner of Newtown Road and Goldstone Lane. Hyde Housing will build 65 new homes – as illustrated in the 3D view. The 40% social housing share required by the City Plan will include 8 affordable rent and 18 shared ownership dwellings. 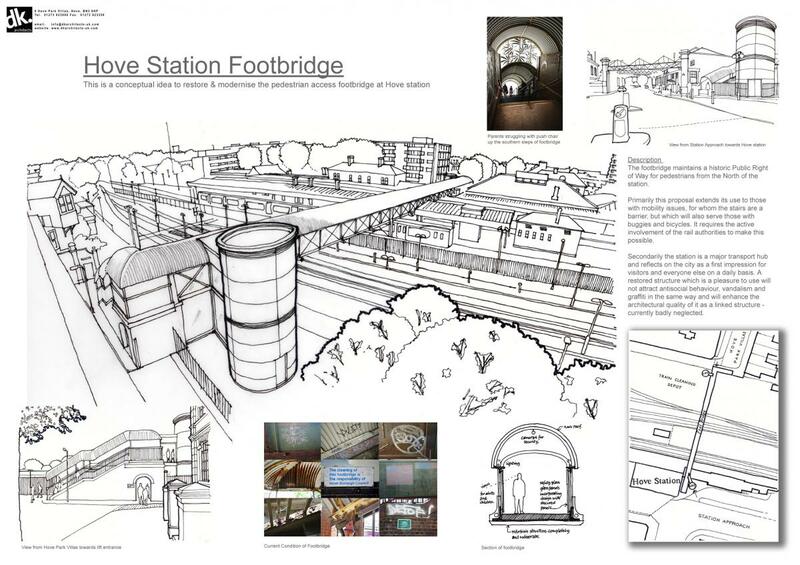 The integrated redevelopment of the area north of the railway and a new pedestrian connection across the railway linking to the station – which the Forum is proposing – cannot be achieved unless the Waste Management Site is withdrawn. This would enable Mountpark to deliver a major mixed used regeneration of 500-600 houses as illustrated by the 3D view. This project will mark the beginning of the transformation of the area west of Goldstone Villas. It will include some 190 homes and limited commercial floor space which will provide new jobs. The Matsim Panels illustrate the scheme and details are available on the Matsim web-site. Our input to the development of this project focused exclusively on the design and layout of the proposed development. The Forum supports the design principles which have shaped the project. We have posted a statement of our dialogue with Matsim on our web-site. We understand that only 10% will be affordable compared with the 40% required by City Council policy and our draft Neighbourhood Plan policies. Provide lifts or an extended tunnel ? Goldstone Villas- Station Road – Denmark Villas – Eaton Villas one-way clockwise gyratory? This would create space to improve the public realm areas in front of the Goldstone Villas shops, the Station entrance , and the petrol filling station – Tesco area. But would this be too disruptive for traffic? Will the Post Office site become available for redevelopment in the next 15 years? If it does should it be used for housing? With the City Council we have to work out the point at which the provision of new housing triggers the need for a new primary school – perhaps on this site? UPDATE June 2018 – Good News! Council officers have already agreed to work in close partnership with us to develop part of this concept plan into the Conway Regeneration Area Master Plan.